Chuckanut Drive is known to Washingtonians as a 20-mile stretch scenic coastal highway between Seattle and Bellingham. As a former Seattleite, I felt inspired by this scenic route when coming up with a design for Bellingham-based Spincycle Yarns’ super-bulky yarn Knit Fast, Die Young. Twisting cables in the blue-green colorway Blueprint felt like they’d fit the bill, and so these quick cabled mitts were born. 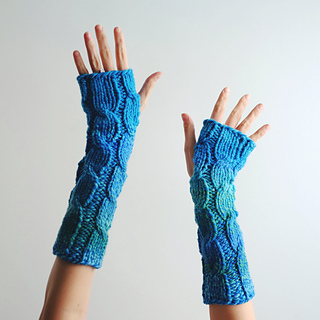 This pattern is available in two sizes, and makes use of needle size to adjust the finished size of the mitts. Both sizes work from the same set of instructions. 1 skein. Shown in Blueprint. Note that gauge is measured over 2” / 5 cm here instead of the usual 4” / 10 cm.